Questions from a Friend: 1. Can you legislate tolerance or morality? The comments with some back and forth discussion numbered were well thought out, sincere and I think reflected the thoughtful worldview of those who responded. I heartily cheer those who responded and expect others wished to respond, but hesitated to do so, especially in light of Jeff’s final question. Reading the forum that his questions initiated, I recognized old debates restated by intelligent people who were born and raised in a postmodern world, where skepticism of anything and everything trumps “walking by faith”. Frankly, I encounter skepticism among my peers who like me are older, but that usually involves “technology”. I personally am less inclined to debate issues, finding that words well chosen often lead to a “winner” but not always to the truth. But still Jeff’s questions intrigued me, because they are not new and yet they are timely. So thank you, Jeff for making me take a new look at old issues. Do you think we can or should legislate tolerance or morality? And yet if you read the Bible or even if you don’t empirical knowledge supports the fact that the intention of the law to govern behavior worked part of the time with some horrendous lapses and the true intention of the law to change the inward man or woman failed pretty much 100% of the time. The intention of God’s Law to shape inner character, love, grace even in the most faithful fell short, because alas we are a fragile, flawed people. As a Christian, I could now lead into a discussion of how Jesus fulfilled the Law of God and set us free from its power, which involved a massive load of guilt for those trying to follow it. But, I will continue to weave that into my posts rather than digressing from the point of this one. Suffice it to say, everything I say and everything I do if it has any worth comes from the rock solid center of Christ in me the hope of Glory. 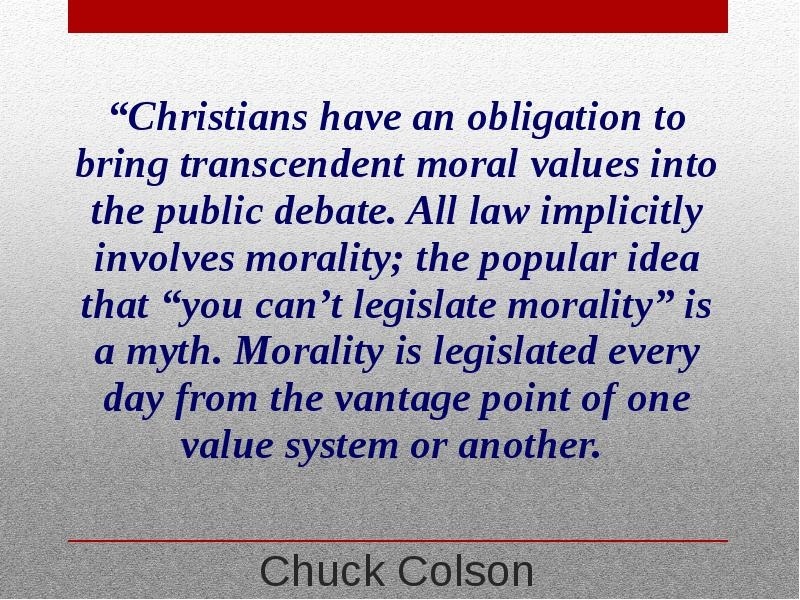 So can morality be legislated through civil law? Yes. Should it be? Yes. 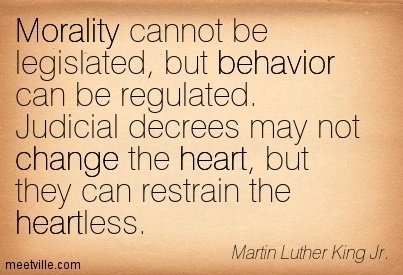 Is all law intended to legislate morality MORAL? No. (for another time) Am I bound to follow it? In most cases, yes? Will it change my inner self, my views, my beliefs? Probably not, but it might open my eyes to a new way of looking at things. Will it produce a kinder, gentler people? Only in those who truly seek to be kinder and gentler and in others who do not care, it will create practiced hypocrites. It will create the facade of political correctness with no depth of human compassion. Next time: How important is political correctness?